The re-imagined and revitalized Greenville has been called South Carolina's Best Kept Secret. Greenville's stylish, West-End restaurant, The Lazy Goat, is one of the best around...but that is no secret to savvy diners in this town. The Lazy Goat is advertised as "a Mediterranean-themed restaurant with a menu featuring global influences from Spain, Morocco, Italy, France, Greece, Africa and the Middle East. The Lazy Goat dining experience is designed around "taking your time and sharing great food and stories," while enjoying "succulent flavors from all around the Mediterranean." The restaurant name is a reference to an old legend about a town's lazy goat and that theme is continued to even the rest rooms which are labeled Billy Goats and Nanny Goats. The Chef, Vicky Moore, and her team follow what they call a "made from scratch" approach to cooking where every item served is almost exclusively made by the culinary team. "Chef Moore graciously came to our table to greet us and share her obvious pride for her delicious food creations. Her energy, enthusiasm and smile are contagious.Her food is delicious. The Lazy Goat menu is divided into five sections - Meats & Cheeses, Graze & Nibble, To Share Or Not To Share, Pastas, and Pizza. We chose to sample a variety of appetizers from the Meats & Cheeses section including the Calabrese: Spicy Italian Salami and Manchego. Our appetizers were so good that after several trips around the table, all that was left were empty plates. For one entree, we chose Steak Frites: Teres Major Tenderloin, Truffled Pommes Frites, Smoky Mushroom Tomato & Veal Demi, Cabrales. For our second entree, we chose the Special of the Day - Steak Pasta. The steak in both recipes was perfectly cooked-to-order, light and delicious. For our desserts we chose the Harvest Tartan and the Dark Chocolate Rasberry Cake. Like the appetizers, these were well-received and enjoyed. Steak Frites: teres major tenderloin, truffled pommes frites, smoky mushroom, tomato & veal demi, "cabrales"
The Lazy Goat has a full cocktail and beer menu as well as a wine menu. Even on a Monday night, the outside deck was at capacity. Situated on a patio above the Reedy River and beside a decorative waterfall, this is obviously a favorite location for local diners. Greenville has more than sixty restaurants in its' walkable downtown and The Lazy Goat, on the Monday night we dined, appeared to be one of the most popular. The Lazy Goat in Greenville, South Carolina is where Mediterranean cuisine meets South Carolina hospitality - a recipe worth enjoying again and again. 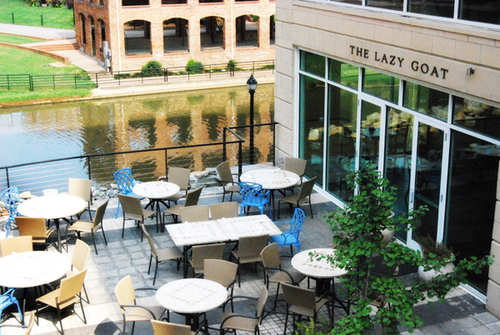 The Lazy Goat is located at 170 Riverplace, Greenville, SC 29601. Their phone number is 864-679-5299. Visit www.thelazygoat.com for more information.